The above image demonstrates a vanishing point in one-point perspective, the simplest form of drawing perspective. In drawing, vanishing points are the points at which lines appear to converge. It is a fundamental concept of composition and perspective drawing. 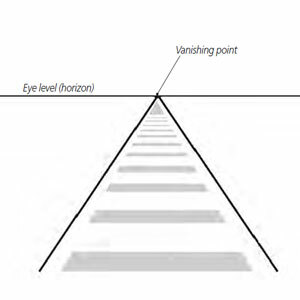 Start by establishing the horizon line, or eye level, and then follow the line of sight to where it meets the horizon line. That is your vanishing point in one-point perspective. For the more complex two- and three-point perspective variations, see: Perspective Basics.